Aayi makes these dosas whenever we get watermelon. Many people throw out the white part between green skin and the red sweet part. We normally use this white part (or the red part of not-so-sweet watermelons) to make this dosa. Cucumber can also be used instead of watermelons. Soak rice for around 5-6hours. Grind rice with other ingredients. Make dosas. Serve with coconut chutney. At the outset, I would like to thank you for a wonderful job you have done in bringing kokani cooking to a new level. Well, I was wondering if at all you have idea on how to prepare Boiled Rice Dosa (Ukde tandla bakri). If you can post the method of preparing this dosa, I would be truly grateful to you. could you plz tell me the measurement of ginger and greenchilly.. is this polo jus like our soye polo or pan polo..(i mean the texture). i tried the above recipe, but it is not the same as in photo also its too hard like roti and not soft like dosa. i used 2 cups of rice(soaked for about 7 hrs)+1 cucumber+ 1/2 cup coconut and grinded all together and added salt. Am i missing anything cos it turns of like roti. Shilpa: Mini, In the photo I had used watermelon’s red part and not cucumber. Watermelon gives the reddish color. I have mentioned 2 cups rice to 1 cup coconut. Coconut makes the dosas soft. Shilpa: Yes, it is a different kind of dosa which does not need urad dal. shilpa, it is a nice variation to use water melon instead of cucumber. Will surely try this. 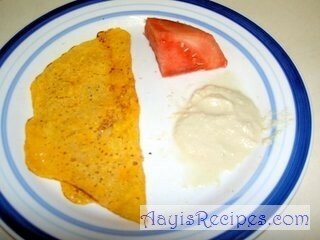 My son likes the normal Tausha dosa.I hope he will surely love this. I made water melondosa, water melon curry and water melon halva with the white portion of the water melon. this recipe of yours i must try. thank you. I usually don’t ferment it. Thanks for kind words Kirti. I am not aware of pejji randai. I will ask mom about it. I asked my aunt and made pejji randai last week and it was truly ultimate. It’s simple.. Pressure cook the chopped vaali leaves and stems. Make paste of coconut, washed raw rice and red chilli. Once vaali is cooked, remove in a pan and boil with the paste, add salt and temper with coconut oil and garlic.